Warner Bros. continues to release some of their greatest classics and Casablanca on Blu-ray is no exception to the rule. Starring two greats of the Golden Age of Hollywood, Humphrey Bogart and Ingrid Bergman, many critics have labeled this movie as one of the best films ever made. Although being a member of generation X, I have seen better movies, however from a historical view, the movie is extremely well made that contains a wonderfully immersive script and some great memorable movie moments. When compared to Citizen Kane, Casablanca definitely runs rings around that other classic, especially with the onscreen relationship between Bogart and Bergman who really gave their upmost in this performance. 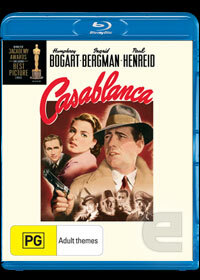 The story of Casablanca revolves around Rick (Humphrey Bogart) an expatriate American who owns a dark and dingy nightclub in Casablanca whose life soon changes for the worse when two freedom arrive, Victor (Paul Heinreid) and Ilsa (Ingrid Bergman) who have escaped from the Nazi's in northern Africa. Although both Victor and Isla were once involved, Rick becomes drawn into this turbulent love triangle. Bergman is quite enjoyable in her role, however the star of the film is Bogart himself who plays the brooding nightclub owner to perfection who unfortunately is caught in a wave of mixed emotions for Isla which involves that classic scene where Sam the piano player plays "As Time Goes By". The film also stars some great supporting cast that include Peter Lorre and Claude Rains who really assist in the atmosphere of this post-war movie that links together a variety of plots from the past and current timelines of these characters as they meet within the famous Casablanca. When it comes to video quality, Warner Bros. have truly revolutionised this movie and have considerably cleaned up the transfer of this movie to the blu-ray format. For a film of its age, the sound is quite clear and crisp, even though it does not use the latest Dolby Digital of today, there was no hiss or crackle heard at all. Match that with some great special features from additional scenes, commentaries by Roger Ebert as the tribute to Casablanca and this is one well presented movie. In conclusion, the Blu-ray version is a wonderful treat for modern cinema that once again allows people of all ages to capture and relive this memorable movie in its current definitive format.